Gov. Ned Lamont said Nayden’s support of Republican gubernatorial candidate Bob Stefanowski had nothing to do with the decision not to reappoint him, instead describing the two men’s departure as an effort to install a new slate of board members to take the university in a new direction at a pivotal time. The State Board of Education, meanwhile, also has a number of empty seats – two of which will remain filled by current members – but still not enough for a quorum. Lamont is expected to name four new members soon and to pursue a candidate for the Education Commissioner post now being held, temporarily, by the current Commissioner Dianna Wentzell. Three other gubernatorial appointees are in place, at least: a commissioner of public health, agriculture commissioner and head of the state’s department of motor vehicles. 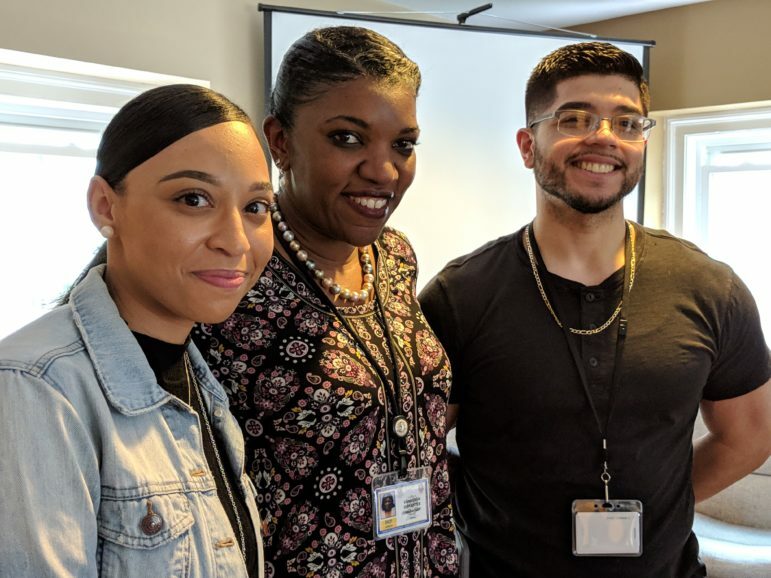 DCF Commissioner Vannessa Dorantes with two DCF social worker trainees, Brenda Whittingham, left, and Michael Quick. Whittingham and Quick were taking part in simulated training exercises Monday. Now settling into her new job as Commissioner of the Department of Children and Families, Vannessa Dorantes has begun a campaign to reduce the state’s number of sleep-related infant deaths. Connecticut has been spared the outbreak of measles troubling some states, but the third case of the year was reported last week. A bigger problem, administrators say, is the state’s financial posture. The Department of Transportation, for example, says it needs 30 percent more than the $1.6 billion in capital improvement funds it gets each year. This, of course, brings up the subject of highway tolls – a subject that has emerged as a defining line between the governor (who favors tolls) and Republicans, who say the state can borrow enough money to make the infrastructure improvements needed to support and help grow the economy. The ongoing debate on tolls has inspired a grassroots opposition campaign and, Saturday, a rally at the State Capitol featuring a number of radio talk show hosts. Connecticut’s cities and towns also have money worries to lay at the legislature’s doorstep. A recent analysis estimated that increasing the minimum wage to $15 would cost them as much as $24 million by 2022, not to mention $7 million in expenses to child care providers who participate in the Care4Kids program. 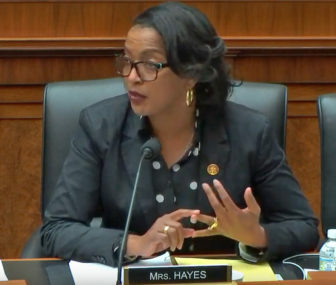 U.S. Rep. Jahana Hayes, D-5th District, questioning U.S. Education Secretary Betsy DeVos. Neither will the state be getting one significant concession from its employee unions this year – new limits on cost-of-living adjustments to pensions. And while it would be a loss of only $7 million or so – a number far to the right of the decimal point in the state’s overall financial picture – legislators appear on their way to ending the prison system’s practice of raising money from the families of inmates calling home. Maybe they can make up for the loss if they legalize recreational marijuana – a measure which moved forward another step last week. U.S. Rep. Joe Courtney, D-2nd District, attacked DeVos’s “baffling” policy of barring states from receiving information they use to protect students from improper practices from lending companies. Connecticut Attorney General William Tong has also objected to this policy, along with attorneys general from 20 other states. Tong is also spending a lot of time opposing the environmental policies of President Donald Trump’s administration.